Chiang Mai Lanna House Real Estate does not warrant the accuracy or completeness of the materials or the reliability of any advice, opinion, statement or other information displayed or distributed through the website (http://www.chiangmailannahouse.com/). You acknowledge that any dependence on any such CONTENT, DATA ACCESSED FROM OR THROUGH THIS website, OPINION, ADVICE, STATEMENT, MEMORANDUM, OR INFORMATION SHALL be at your sole risk. Chiang Mai Lanna House Real Estate reserves the right, in its sole discretion, to correct any errors or omissions in any portion of the website. Chiang Mai Lanna House Real Estate may make any other changes to the website, the materials and the products, programs, services or prices (if any) described in the website at any time without notice. This website and the information and materials on the website are provided "as is" without any representation or warranty, express or implied, of any kind, including, but not limited to, warranties of merchantability, non-infringement, or fitness for any particular purpose. Chiang Mai Lanna House Real Estate does not represent or warrant that materials in this website are accurate, complete, reliable, current, or error-free. Chiang Mai Lanna House Real Estate is not responsible for typographical errors or omissions relating to pricing, text, or photography. While Chiang Mai Lanna House Real Estate attempts to ensure your access and use of the website is safe, Chiang Mai Lanna House Real Estate cannot and does not represent or warrant that this website or its server(s) are free of viruses or other harmful components. Information published by Chiang Mai Lanna House Real Estate from time to time is considered to be true and correct at the time of publication, however, changes in circumstances after the time of publication may impact on the accuracy of this information and Chiang Mai Lanna House Real Estate gives no assurances as to the accuracy of any information or advice contained. All content (content being images, text, sound and video files) contained in this website, http://www.chiangmailannahouse.com/ is protected by international copyright, trademark, and / or other applicable law and may not be reproduced or used for any purpose whatsoever other than for non-commercial, private viewing purposes. All rights in the pages, website content and arrangement are owned by © Chiang Mai Lanna House Real Estate. The content of this website can be accessed, printed and downloaded in an unaltered form with copyright acknowledged, on a temporary basis for personal study that is not for a direct or indirect commercial use and any non-commercial use. Any content printed or downloaded may not be sold, licensed, transferred, copied or reproduced in whole or in part in any manner or in or on any media to any person without the prior written consent of Chiang Mai Lanna House Real Estate. No part of the website may be reproduced in any form except as stated herein without the user's obtaining the prior written consent of the publisher, with the exception that permission is hereby granted for the use of this material in the form of quotations of brief passages in reviews where the source of those quotations is acknowledged. Users are advised that information on hyperlinked or referred-to websites is neither investigated nor analyzed by Chiang Mai Lanna House Real Estate. No warranty or representation, express or implied, is given as to the accuracy or completeness of that information. In no event will Chiang Mai Lanna House Real Estate, nor any of its owners, employees or advisors accept any liability with regard to the information contained in the referenced websites. Chiang Mai Lanna House Real Estate is not responsible for the content of any other internet websites linked to by this website. A link to another website is meant for convenience only and does not imply that Chiang Mai Lanna House Real Estate endorses the website or any products or services that it describes. Your access to and use of any other internet websites linked to or from this website is at your own risk and Chiang Mai Lanna House Real Estate assumes no obligation or liability in connection therewith. Chiang Mai Lanna House Real Estate reserves the right to terminate any link or linking program at any time. While Chiang Mai Lanna House Real Estate uses reasonable efforts to include accurate and up-to-date information on this website, errors or omissions sometimes occur. Chiang Mai Lanna House Real Estate expressly disclaim any liability, whether in contract, tort, strict liability or otherwise, for any direct, indirect, incidental, consequential, punitive or special damages arising out of or in any way connected with your access to or use of this website. All information on this website, including but not limited to graphics, text and links to other websites, is provided "as is" and is subject to change without prior notice. Such information is provided, to the fullest extent permissible pursuant to applicable law, without warranty of any kind express or implied, including but not limited to implied warranties of merchantability, fitness for a particular purpose, non-infringement and freedom from computer viruses or similar disabling devices. Chiang Mai Lanna House Real Estate does not warrant the adequacy, accuracy or completeness of any information on this website and expressly disclaim any liability for errors or omissions therein. Users are responsible for evaluating the accuracy, completeness or usefulness of any information or other content available on this website. Chiang Mai Lanna House Real Estate does not warrant the error free and uninterrupted service of this website. 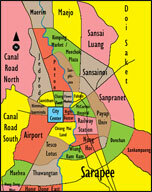 Chiang Mai Lanna House Real Estate operates the website available at http://www.chiangmailannahouse.com/ ("website"). We respect the privacy of each user of the website (referred to as "you" or "a user"), whether you are just beginning your real estate search or have previously visited our website. This Privacy Statement gives you specific information about how we protect your privacy, how we treat information we collect on the website that identifies an individual user ("Personal Information"), and how we use aggregated information. BY USING THE WEBSITE, YOU SIGNIFY YOUR ACCEPTANCE OF THIS PRIVACY STATEMENT. IF YOU DO NOT AGREE TO THIS PRIVACY STATEMENT, YOU CANNOT USE THE WEBSITE. We reserve the right to modify this Statement at any time. Chiang Mai Lanna House Real Estate will do its best to ensure that the processing of your personal data is carried out in such a way that your privacy is protected and safeguarded as much as possible. Chiang Mai Lanna House Real Estate collects your personal data only to the extent that it is necessary to provide you with our services, for the development of web statistics reports, web surfing analysis solely regarding the http://www.chiangmailannahouse.com/ website, and to comply with mandatory requirements. Chiang Mai Lanna House Real Estate collects and stores the following visitor information regarding the usage of this website: date and time of day you access our website, time zone, screen resolution, browser type, browser language, the Internet Protocol (IP) address of the computer you are using, number of hits, the pages visited, previous / subsequent websites visited, length of user session and anonymous aggregate reports regarding visitor interactions that may include for example: aggregate reports of clicking or mouse activity, aggregate reports of scrolling activity and recreation of visitor browsing sessions solely regarding the http://www.chiangmailannahouse.com/ website. Chiang Mai Lanna House Real Estate does not collect any unique information or any personal data about you (such as your name, e-mail address or other contact information) except when you specifically and knowingly provide such information. Chiang Mai Lanna House Real Estate does not collect any information about other websites you visit, programs you run on your computer, passwords you use or any other key strokes in fields that have been qualified as sensitive by the webmaster of such websites. This website is controlled and operated by Chiang Mai Lanna House Real Estate. All content on this website, including, but not limited to text, images, illustrations, audio clips, and video clips, is protected by copyrights, trademarks, service marks, and / or other intellectual property rights (which are governed by worldwide copyright laws and treaty provisions, privacy and publicity laws, and communication regulations and statutes), and are owned and controlled by Chiang Mai Lanna House Real Estate. Content on this website or any website owned, operated, licensed or controlled by Chiang Mai Lanna House Real Estate is solely for your personal, non-commercial use. You may print a copy of the Content and / or information contained herein for your personal, non-commercial use only, but you may not copy, reproduce, republish, upload, post, transmit, distribute, and / or exploit the Content or information in any way (including by e-mail or other electronic means) for commercial use without the prior written consent of Chiang Mai Lanna House Real Estate. You may request consent by sending a request to Chiang Mai Lanna House Real Estate via our Contact Us page. Without the prior written consent of Chiang Mai Lanna House Real Estate, your modification of the Content, use of the Content on any other web website or networked computer environment, or use of the Content for any purpose other than personal, non-commercial use, violates the rights of the owners of Chiang Mai Lanna House Real Estate copyrights, trademarks or service marks and other proprietary rights, and is prohibited. As a condition to your use of this website, you warrant to Chiang Mai Lanna House Real Estate that you will not use our website for any purpose that is unlawful or prohibited by these Terms, including without limitation the posting or transmitting any threatening, libelous, defamatory, obscene, scandalous, inflammatory, pornographic, or profane material, nor in violation of the Acceptable Use Policy of the website hosting service provider. If you violate any of these Terms, your permission to use our website immediately terminates without the necessity of any notice. Chiang Mai Lanna House Real Estate retains the right to deny access to anyone at its discretion for any reason, including for violation of these Terms. You may not use on your website any trademarks, service marks or copyrighted materials appearing on this website, including but not limited to any logos or characters, without the express written consent of the owner of the mark or copyright. You may not frame or otherwise incorporate into another website any of the Content or other materials on this website without prior written consent of Chiang Mai Lanna House Real Estate. These Terms are for the benefit of Chiang Mai Lanna House Real Estate, its Providers, and Web website hosting service providers, and its and their officers, directors, employees, affiliates, agents, licensors, and suppliers. Each of these individuals or entities shall have the right to assert and enforce these Terms directly against you on its or their own behalf. Unless otherwise specified, the Content contained in this website is presented solely for your convenience and / or information. This website is controlled and operated by Chiang Mai Lanna House Real Estate from its offices within Chiang Mai, Thailand. Chiang Mai Lanna House Real Estate makes no representation that Content in its website is appropriate or available for use in other locations. Those who choose to access this website from other locations do so on their own initiative and are responsible for compliance with local laws, if and to the extent local laws are applicable. You may not use or export the materials in this website in violation of Thai export laws and regulations. These Terms shall be governed by, construed and enforced in accordance with the laws of Chiang Mai, Thailand, as they are applied to agreements entered into and to be performed entirely within such Province. Any action you, any third party or Chiang Mai Lanna House Real Estate brings to enforce these Terms, or in connection with any matters related to this website, shall be brought only in Chiang Mai, Thailand and you expressly consent to the jurisdiction of said courts. If any provision of these Terms shall be unlawful, void or for any reason unenforceable, then that provision shall be deemed sever able from these Terms and shall not affect the validity and enforceability of any remaining provisions. The provisions and conditions of these Terms, and each obligation referenced herein, represent the entire Agreement between Chiang Mai Lanna House Real Estate, its affiliated or related entities, and you, and supersede any prior agreements or understandings not incorporated herein.